SEAN: Usually it’s just Jump/Beat weeks and Yen Press weeks that are when I whine about it being a lot, but there’s no question: this is a lot. Bookwalker has an 8th volume of The Combat Baker and Automaton Waitress. J-Novel Club has a new debut, though the author is familiar. 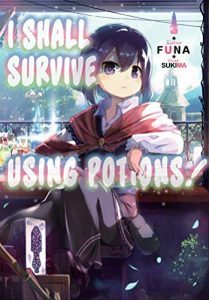 I Shall Survive Using Potions! is from the same author as Make My Abilities Average and Saving 80,000 Gold, and the scenario is similar: teenage overpowered girl. She’s reincarnated by accident, so asks for a lot, and gets it. I’m hoping this is as ridiculous as the author’s other series. They also have the 8th volume of How a Realist Hero Rebuilt the Kingdom, the 12th I Saved Too Many Girls and Caused the Apocalypse, the 19th Invaders of the Rokujouma! ?, and a 4th Lazy Dungeon Master. Kodansha, in print, has Tokyo Tarareba Girls 5. SEAN: Kodansha, digitally, has a lot more, including a debut, My Sweet Girl. This Betsufure title is about a small, boyish, awkward girl who finds love with a popular boy. Not to be confused with other shoujo titles that might sound the same. MELINDA: That does sound cute! I mean, not original, but totally cute! SEAN: They also have Boarding School Juliet 8, Crocodile Baron 2, I’m Standing on a Million Lives 5, Kamikamikaeshi 8 (a final volume), Tokyo Alice 8, and The Walls Between Us 4. MICHELLE: Someday I will read a few of these. SEAN: Seven Seas debuts Beauty and the Beast Girl, which is a single-volume release. It’s a yuri manga about the love between a monster girl and a blind girl. ASH: Hmmm, that could be interesting! MELINDA: This sounds kind of awesome. I have a new appreciation for monsters lately. SEAN: There’s also Kase-san and Cherry Blossoms (the 5th in this uniquely named series), My Solo Exchange Diary 2, and Please Tell Me, Galko-chan! 5. Interested in pretty much all of this. ASH: My Solo Exchange Diary is another one of those good but cutting series. SEAN: SuBLime gives us Punch Up! 5 and A Strange and Mystifying Story 6. MICHELLE: I’m liking A Strange & Mystifying Story since it has moved on to a new couple. ASH: Huh, I didn’t realize Punch Up! was still ongoing. SEAN: Tokyopop has three releases next week! 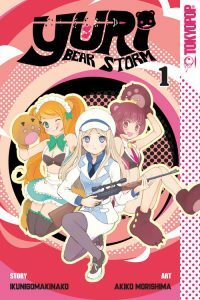 The debut is Yuri Bear Storm, whose anime is already famous… or infamous. I hear, much like Utena, that the manga is a bit less weird. It’s a Comic Birz title, of course. MELINDA: What Ash said. Like. Yeah. SEAN: They’ve also got a 3rd Futaribeya and a 3rd Konohana Kitan. Vertical has a 12th volume of Devils’ Line. Lastly, Viz gives us a 4th Fullmetal Edition of Fullmetal Alchemist, a 34th Magi, a 2nd Record of Grancest War, and a 5th Sleepy Princess in the Demon Castle. ANNA: Sleepy Princess can always be counted on for funny hijinks. MELINDA: Also, everyone should always read Fullmetal Alchemist and that’s basically an order. SEAN: Seem like a lot? It’s actually only about half of the volume total for the week after next. What are you getting? Despite My Lesbian Experience with Loneliness still being in the top five in sales of LGBT manga after 88 weeks, Amazon has yet to post My Solo Exchange Diary v.1 digitally. I am frustrated (…though obviously not as much as Kabi >.>). Why must availability of Seven Seas titles be so inconsistent? I’m with Sean in wanting basically everything they’re publishing next week (except Please Tell Me, Galko-chan! which looks atrocious on even a $370 Kindle). Crocodile Baron has my vote for greatest title of the year so far. TokyoPop publishing Yuri Kuma Arashi is tragic and offensive and makes me want to buy the Japanese edition. Melinda, I’ve never harbored the briefest interest in FMA since it debuted. I hearby stand for court martial in dress blues.